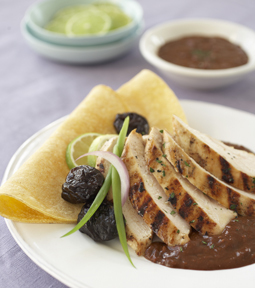 Grilled Chicken Breast with Smoky Dried Plum & Chipotle Mole - A recipe from Savor California, the online showcase for extraordinary gourmet foods and beverages from California. In saucepan, bring broth and dried plums to a boil. Remove from heat, cover and let sit 15 minutes. With slotted spoon, remove half the dried plums; reserve for garnish. In blender, purée remaining dried plums, broth, chipotles and 1/4 cup of the almonds. Sprinkle chicken breasts with chili powder; season with salt. On gas or charcoal grill, or in heated grill pan, grill chicken about 4 minutes on each side or until cooked through. Grill tortillas, or heat in oven or steamer. Slice chicken; divide among 6 plates. Spoon mole over chicken. Garnish with reserved dried plums and almonds; sprinkle with cilantro. Serve tortillas on side. Tip: for spicier mole, do not rinse or seed chipotles.